On arriving at the Uluwatu Temple, in the parking lot, there are many food and drink vendors. There we can buy a few drinks, to be brought into the temple area. Because in the temple area there is no single food or beverage vendors. Before entering the area of ​​Uluwatu Temple, which is located by the sea, we are required to wear a tie waist. It aims to us courtesy when entering area Uluwatu Temple. And to maintain the sanctity of the temple. Wherever, if we want to enter the temple in Bali, if not the purpose of prayer, we are obliged to wear a tie waist, to maintain the sanctity of the temple. 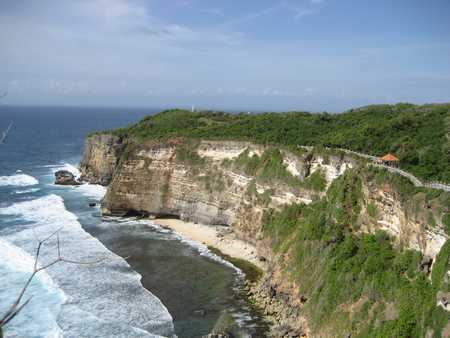 Tickets to enter the area of ​​Uluwatu Temple is quite affordable. But the price is very different from, the tickets for domestic tourists, with tickets to foreign tourists. But the price is still quite logical. Because foreigners purchasing power is higher, compared to the local people. Even if we are aiming to do worship, and worship at Uluwatu Temple, we are not obligated to buy tickets to enter. From the post purchase tickets go to Uluwatu Temple area, we have to go through the steps as far as 200 meters. Around the road we have to be careful, and always keep our luggage. Because in the Uluwatu Temple, there are many wild monkeys, who always wants food from visitors to the temple. 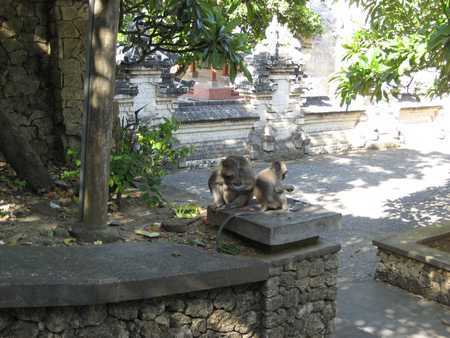 Arriving in the area of ​​Uluwatu Temple, we are greeted wild monkeys are very much at all. We must be careful here. Events air temple area is quite cool and fresh, based on the people of Indonesia. Wind bersembuh fast enough, it is because it is located on the seafront. Events in the area of ​​Uluwatu Temple is not so crowded. Occurs only crowd at the celebration held Pura Uluwatu temple ceremony. For tourists who love the culture and traditions of the Balinese, it comes highly recommended when in the Pura Uluwatu temple ceremony. Because the atmosphere is very lively and charming. If you want to see Uluwatu Temple with amazing condition, try heading to the west. Follow the path there. The path is located right on the cliff. But do not worry, the trail is lined with a very solid concrete. It is impossible we will fall into the sea, if it is not willing to commit suicide there. Arriving at the end of the path, there is a small hut to rest. 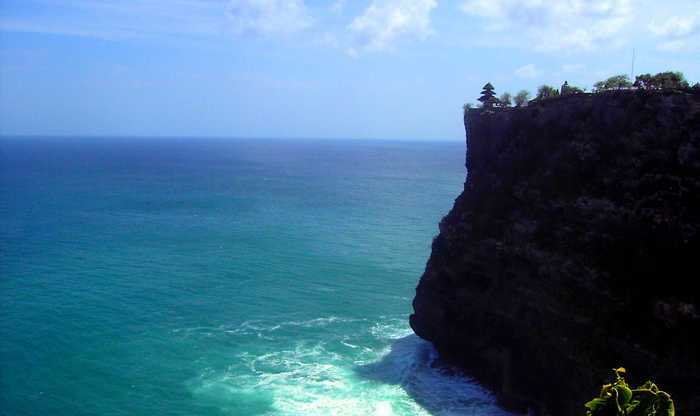 From there we could see the beautiful Uluwatu Temple, located at the tip of a very high cliff, over the vast sea. If it is felt, must have been terrible. But if you enjoy it, it will look very beautiful. Continuous waves hitting the cliffs below the Uluwatu Temple, made ​​a very interesting sight. Astonishingly, the cliff is never destroyed thousands of years ago. That's the natural wonders of the Lord. Wait until the afternoon. Wait for the sunset, and see the sun setting behind the Pura Uluwatu. Very beautiful and amazing. Puru sunset at Uluwatu is very beautiful, the sunsets are difficult to find anywhere in the world. 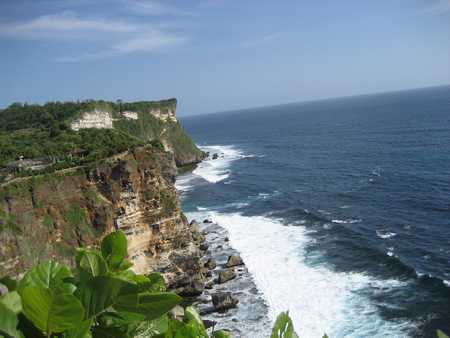 Beautiful cliffs in the area of ​​Uluwatu Temple, decorated by beautiful ombat. But the elusive Pura Uluwatu region closest hotel to stay. If you come to Pura Uluwatu, enjoy the beauty of the sunset there with your lover.